I'm so excited to finally be able to write this post! I've been itching to write about this new line of skincare, ever since the first day I tried it out. I absolutely love two new products that Sephora released this month with their skincare collection. Now, despite what you may think, I am SUPER DUPER LAZY when it comes to skincare! Give me an all-in-one solution, and I'm happy! What exactly does this mean? Well, I don't like taking off my makeup before I wash my face, and I hate having to layer millions of products on my face just to keep it looking nice! 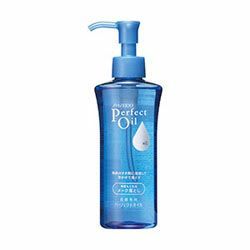 For the past 6 months or so, I've found something amazing that works well for my skin: Shiseido Perfect Oil. This stuff is the bomb! It's perfect for me because it removes all my makeup, and washes it right off after I wet it. This product here is a pure oil, and it emulsifies all the make up that I have on my face at the end of the day - add a little water and this baby washes off clean, leaving my face feeling hydrated! But then I started to think to myself, what am I going to do when summer comes around? Using a oil as a cleanser is definitely going to be heavy for the summer months, so I started searching around to see what would work for me. I also use Philosophy's Purity cleanser, which does all the makeup removal for me as well, but I find that to be a little creamy sometimes, especially if my face is a little oilier. 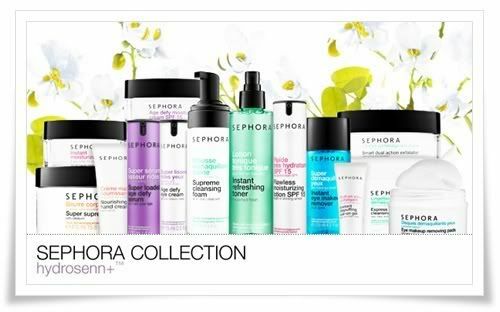 After a while, my search was over when I looked into the Sephora Skincare Collection that recently launched over the past couple days. Formulated with Hydrosenn+, this beauty giant claims their breakthrough product is even more hydrating than hyaluronic acid. Ding ding ding!! With our winter weather this year being so nasty, my cheeks have been abnormally dry! I knew I had to check this out. 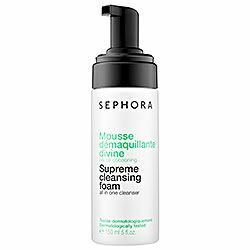 I picked up their supreme cleansing foam, which is promises to remove makeup and cleanse the skin all in one step. The pump itself makes the product into a nice foam, and I find 2 pumps is enough for my face. The smell is pleasant, and it does indeed remove all my makeup. However, I find that sometimes it stings my eyes HAHA, only on certain days though. I tightline my eyes with eyeliner, which is why I have to use the product so close to my eyes. I guess that's my punishment for being super lazy. Its opthalmologically tested, so I don't suppose I will go blind with continued use. It's a very nice, light cleanser, and I'm excited to start using this once the summer months come around!! Now for my face. Dang Jack Frost just isn't leaving me alone this year! I normally do not have problems with dry skin in the winter, but after all the moisturizing and exfoliating I have been doing, little patches around my nose, cheeks, and eyes are showing bits of flakiness. 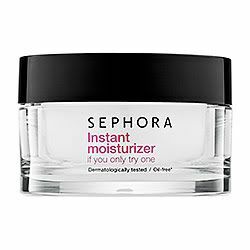 I decided to check out their instant moisturizer, which also contains Hydrosenn+, and guarantees to moisturize 'intensively'. It has the same scent as the cleanser, which I happen to like. The cream texture is not very thick, it runs a little on the watery side, which made me wary of it's effects. However, after one application overnight, my skin was NO LONGER DRY! Crazy, I tell you. I am so impressed with this moisturizer. It makes my skin super smooth and hydrated, and for the price tag of $24, I'm so happy! It doesn't take much product to moisturize your face, so it's going to be lasting a very long time. I seriously use just a little dab! I am oh so happy. Now you know why I've been excited to write this post! Try it out :) I guarantee you will like it!